The see through Mini Dress, made of lace or crochet, was worn by Vicky Tiel while working at the Cafe Wha in Greenwich Village, NYC. She was known as “Peaches La Tour” at the club, and her job was to “pass the hat” for folk singers Bob Dylan, Fred Neil, and comedian Woody Allen. She was a student at Parsons School of Design in NYC at the time. In a movie studio cafeteria in September 1964, Elizabeth Taylor spotted Vicky Tiel wearing a lace mini dress, and immediately told her husband, Richard Burton, that she loved the dress. Later, when Richard saw Vicky again, he ordered a pearl covered lace mini, with matching lace stockings, as a surprise for Elizabeth for their November wedding anniversary. Elizabeth loved the dress so much, she stopped wearing all of her knee length French couture suits, and completely changed her fashion style. 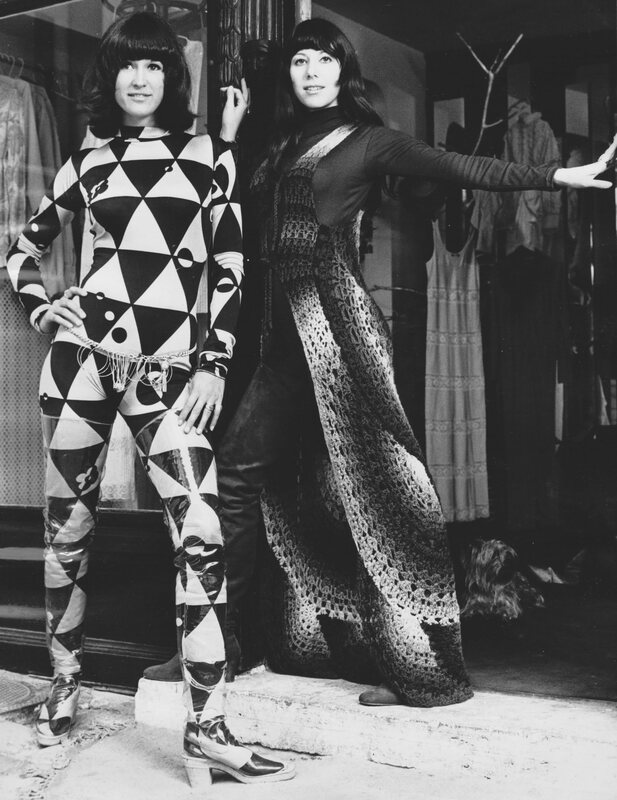 The original Jumpsuit, made in a jersey knit with a zipper, was designed by Fonssagrives -Tiel in 1964, as costume designers for Woody Allen’s first film, “What’s New Pussycat”. It was custom made for actress Ursula Andress to wear in the movie. 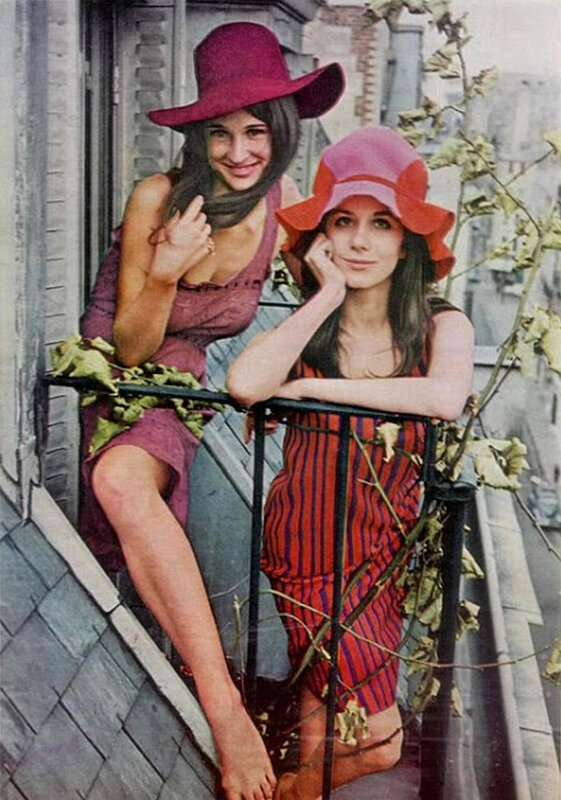 In 1968, the jumpsuit became a best seller at the Mia- Vicky Boutique in Paris, which opened that May at 21 Rue Bonaparte. It was later sold to Henri Bendel NYC, first in a wool knit version, and then in leather. Barbra Streisand purchased the leather version in two colors, red and navy. In the penthouse suite at the Dorchester Hotel in London, Elizabeth Taylor and Vicky Tiel created “Elizabeth’s Caftan” together. This outfit worked very well for Elizabeth’s life, which was mostly spent in and out of hotels. It became Elizabeth’s most iconic outfit. 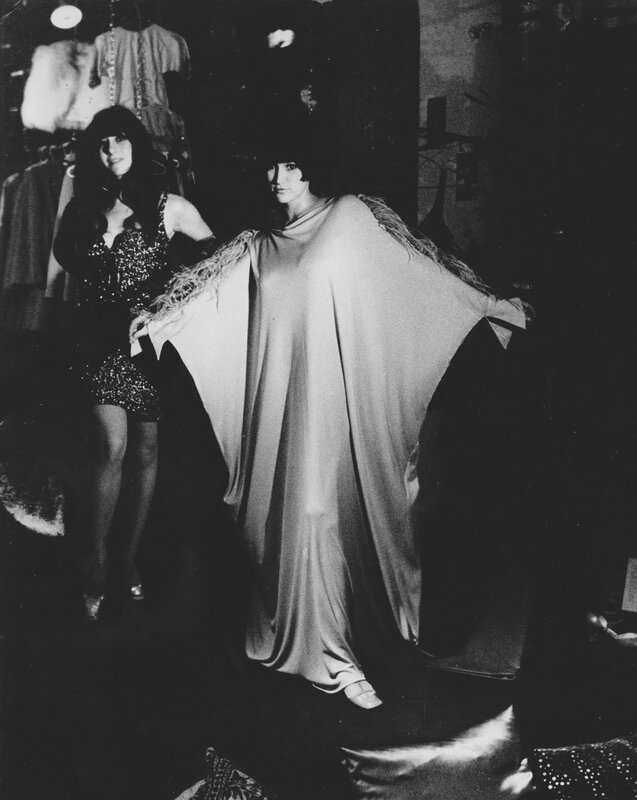 The caftan was made from matte jersey, which draped sensually, clinging to the body, especially the breasts. The first Hot Pants, designed by Mia Vicky, were made of a wool knit, and worn with matching floor length wool sweaters. In 1968. their hot pants were designed to be worn with short, rayon wrap tops, exposing the midriff. These designs were best sellers in the Mia-Vicky Boutique in Paris. 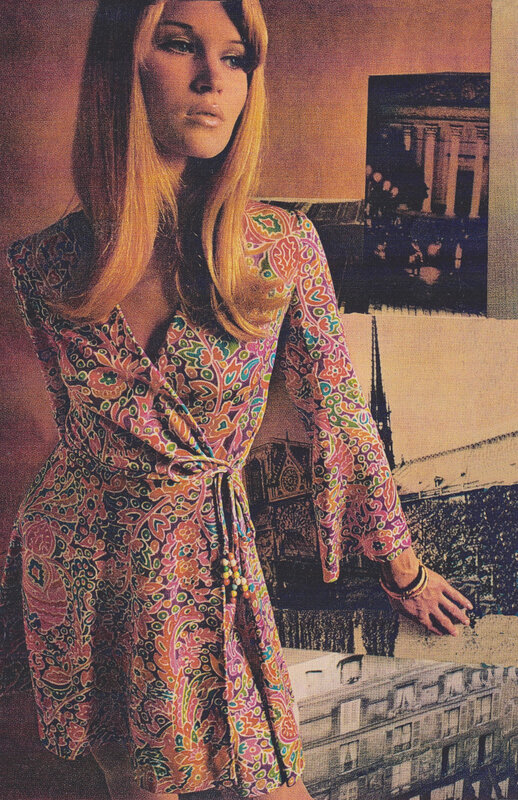 The Wrap Dress was first designed by Fonssagrives -Tiel for the film “Candy” in 1967. 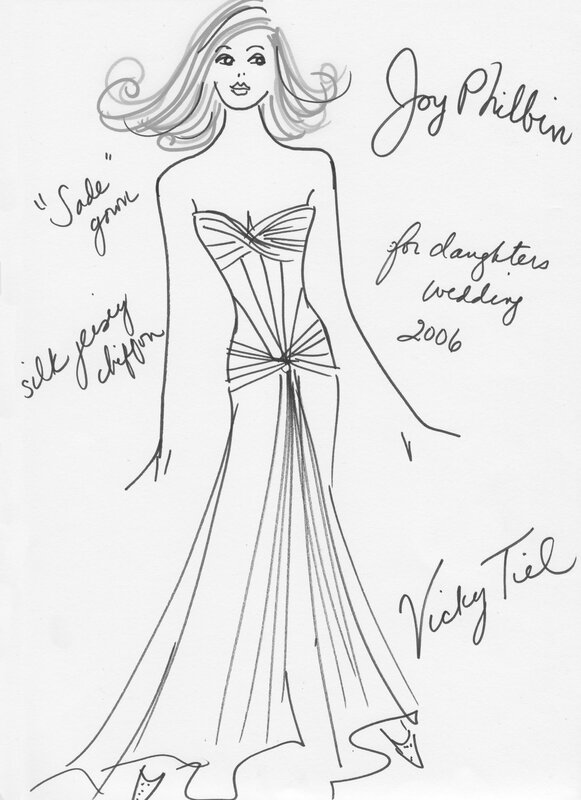 The dress had a flared bias skirt, set in sleeves and fitted waistline. That year, Joan Arkin, a NYC dress company, licensed Fonssagrives -Tiel designs, and sold the wrap dress to Bloomingdales. It was featured in Redbook Magazine (photo on left). In January 1968, the wrap dress was shown in a Couture fashion show at Maxim’s Paris, celebrating the opening of the Mia Vicky Boutique with partners Elizabeth Taylor and Richard Burton. 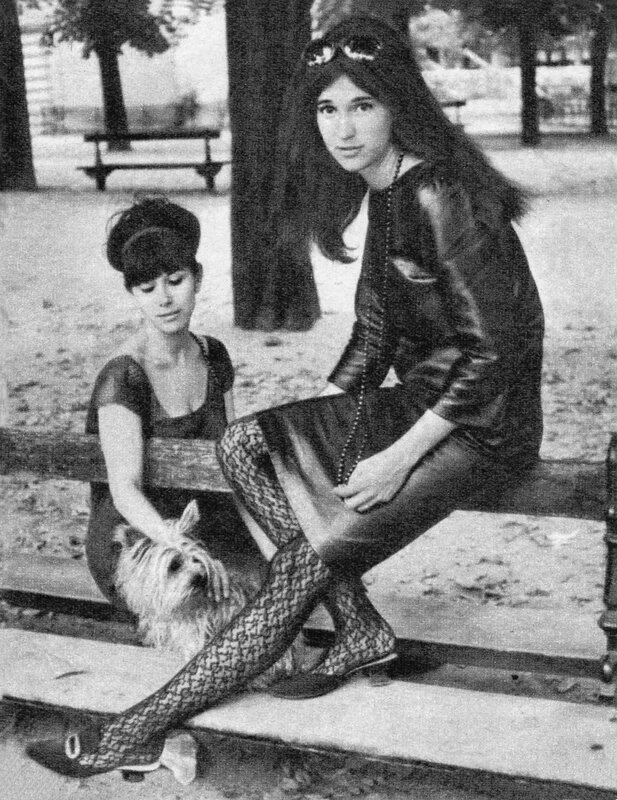 In 1971, Mia left Paris, and the business name and label was changed to “Vicky Tiel”. The “Bra Dress” was designed as part of the premier collection under the new label. Elizabeth Taylor remained a partner in the business for the next 24 years. Although considered a fashion of the 1980’s by many, the original Pouf Dress was introduced in 1976, as part of the premier collection for the Vicky Tiel boutique in Henri Bendel’s NYC. The dress was displayed in the store’s Spring 1976 windows, and featured in French fashion magazines, years before other French designers. “The Pretty Woman Dress” was originally designed as a strapless dress, for French actress Anne Parillaud to wear to Cannes Film Festival in 1977. It was later sold to Giorgio’s Beverly Hills, where it was often displayed in the windows. The red silk jersey version with draped sleeves, featured in the shop’s Rodeo Drive windows, was copied for Julia Roberts to wear in the 1989 film “Pretty Woman”. Since then, it has been known as the “Pretty Woman Dress”, and has been on many of the “Best Dresses in Movie History” lists. The Pretty Woman Dress has been sold in Neiman Marcus stores for 32 years continuously from 1983 to today. The 24 visible metal boned “Corset Dress” was first made for the Bergdorf Goodman Bridal Department in 1985. The dress, made of silk jersey or beaded lace, continues to sell for 30 years in the Couture Department. It is a favorite of celebrities walking the Red Carpet, brides, and mothers of the bride, as it makes the waist 2-3 inches smaller.